One of the most elegant interpretations of the single column text setting during the recent revival of reader-friendly Bibles has to be Crossway’s Legacy ESV. The first generation was printed by LEGO in Italy, and the second — the Heirloom Legacy — by Jongbloed in the Netherlands. Now a new Heirloom Legacy has arrived, improving on the original in two significant ways: it opens flat, and it comes in a wider variety of colors. At a certain point last month during my visit to Evangelical Bible outside Richmond, VA, I was left alone in the warehouse with instructions to “take whatever you want.” Review copies being the life blood of the blog, you would think this was the high point of the experience. You would be wrong. As much fun as it was to dig through the stacks for anything I hadn’t written about already, the real adventure was waiting down the hall in the conference room. Three new editions of the Heirloom Legacy ESV had just arrived. While the publisher, Crossway, would be offering the black and dark brown bindings, through an exclusive arrangement Evangelical Bible had dibs on Heirloom Legacies bound in dark green, blue, and purple goatskin. There they were, arrayed on the table awaiting inspection. Above: The uncorrected reference photos I snapped at the conference room table. Despite the color cast from the artificial light, you get a feel for what made me so excited. The first glimpse appeared on Bible Design Blog’s Instagram feed, so if you are not following @bibledesignblog, you really should be. This edition of the Legacy has been a constant companion ever since. The elegant book block combined with the new binding showcased all the Legacy’s strengths. If there was one drawback it would have to be the thickness of the book. Not a slimline by any means, it seemed best suited for the lectern or pulpit (which is where it served through the end of May 2017). Three generations of the Single Column Legacy: The first edition, rebound by Leonard's Book Restoration (bottom), the original Heirloom Legacy (middle), and the new Heirloom Legacy (top). As fond as I became of the Heirloom Legacy, however, one thing prevented me from retiring my first generation edition in favor of the new one. The magnificent bindings had a hidden flaw, a reinforced hinge along the spine that proved so stiff that the book would not open flat. In February 2015, I documented the problem in a post about “the Jongbloed hinge.” The Heirloom Legacy was not the only edition to suffer from this problem. It was common to many Heirloom and Schuyler editions. Pretty much any binding coming off the Dutch production line might be affected. Occasionally I would hear from readers who’d convinced themselves that the bug was actually a feature — the stiff hinge helped support the otherwise floppy book block — but aesthetically, there was just no denying that the way the hinge construction pinched the spine closed was less than desirable. So before that afternoon in the Evangelical Bible conference room, here’s where things stood. The Legacy layout started off elegant, then received a facelift that made it more portable without compromising its integrity. The original bindings had been superseded by laudable Heirloom editions (I am particularly fond of the dark brown), but these suffered from a minor handicap, the stiff hinge. When I recommended the Heirloom Legacy to readers, I had to do so with the proviso that it would take a little use and abuse before the book would, hopefully, open flat — or at least flat-er. Every generation of the Legacy has brought refinements, and the third proves to be the charm. The first thing I noticed about the new Heirloom Legacy is that it opens flat. That pesky hinge is no more. To give you a sense of how dramatic a change this is, I photographed my original Heirloom Legacy back-to-back with the new one, both opened to the same page. As you can see, the original, despite use, remains pinched. The hinge stops at a forty-five degree angle, spearing the book block about a quarter-inch from the spine. It may not seem like much, but when you’re holding the book open in your hand, you really are conscious of the resistance, particularly when reading from the first and last few books. Another kind of refinement comes not through change but repetition. These edge-lined goatskin covers with leather lining and a fine reinforcing stitch around the perimeter have been coming out of Jongbloed for several years now, and long experience has ironed out all the kinks. The details are executed with the kind of precision that comes through a commitment to quality lived out over time. My review copy reached me several weeks after my visit to Evangelical Bible. I chose green because the color occupies a special place in my heart, and I played a small part in re-introducing it to the publishing palate. Back in 2012, the options were few, a fact I lamented in a post arguing for green bindings. Though still rare, green Bibles are now a thing once more, and I love the way this particular shade goes all chameleon depending on the light. A bright sun brings out the midtones, whereas shadow can make the cover read as almost black. This edition follows the Schuyler convention of pairing the green cover with a brown leather lining, a nice woodsy combination Robin Hood would have approved. There is a decorative gilt line around the inner edge, art-gilt edging on the book block, and three narrow ribbons in progressively lighter shades of gold — all familiar details from Schuyler editions in this color scheme. Above: Paired with a green journal from R. L. Allan and a dark green Pilot Custom 74 fountain pen, the Heirloom Legacy makes the case for one of my favorite colors. The Heirloom Legacy (above, bottom) may be the same thickness as the Personal Size Quentel (top), but its wider, taller footprint makes the Legacy feel quite large in comparison. There are people who hate limp bindings because a large book with a flexible binding can be difficult to hold in your hand. It spills out of your grip. The outer edges sink away. Even if the weight is balanced, you seem to need both hands just to hold the page level enough to read at a glance. But you can read a limply bound book single-handed, provided you know the trick. Instead of trying to keep both sides level as if your hand were a tabletop, double the cover over. With an edge-lined cover, this will not stress the spine, and it reduces the amount of bulk you have to grapple with considerably. Above: The Heirloom Legacy’s limp binding makes Bible yoga a breeze, but also makes it so flexible it feels as if it might slip from your grasp. One-handed reading is possible, if your hands are large enough, but the best way is to double over that limp cover. The tag inside my gloves says Size 9. When I rest the spine of the Heirloom Legacy in my palm, my longest finger extends about three quarters of the way to the edge. That’s good enough for single-handed reading without having to fold back the cover. Still, I find myself doubling it over anyway because I like how handy the book becomes. Give it a try and your appreciation of limp bindings is sure to increase. When the Legacy arrived in 2012, the fact that lacked cross references and moved section headings from the text into the margin made it one of the most reader-friendly layouts on the market. Five years later and we are spoiled for choices. By today’s standards, having chapter and verse numbers still in the text blunts the impact from a deep reading standpoint. Still, the Legacy occupies a popular sweet spot between readability and usability. It’s a lot more readable than double column reference editions, and a bit more than single column references like the Cambridge Clarion. Yet it’s a lot more usable in church and group study settings than an edition with no chapter and verse indicators at all. This may help explain why, among my acquaintances in pastoral ministry, the Heirloom Legacy is perhaps the most common high end edition. More than once I’ve found myself in a conversation where this blog is mentioned. “Oh, you like fancy Bibles?” someone will say. “Take a look at what I’ve got!” Two times out of three, the edition he pulls from his briefcase or runs to his desk to retrieve is going to be an Heirloom Legacy. Partly this must be due to Crossway’s marketing reach. If you are not, shall we say, a Bible enthusiast, and you still rely on mainstream channels to discover what’s available, the Heirloom line is the best you are likely to know about. But I suspect the reason the Legacy in particular is so popular is that it looks so elegant with its reader-friendly text column and luscious margins, yet when necessary you can still reference chapter and verse. That is certainly one of the appeals to me. As much as I have tried to wean myself off of referencing verse numbers when preaching or teaching, referring instead to the text the way you would in teaching any other book, the habit dies hard. Citing a verse number is just so convenient. I can’t help myself. I do it all the time. 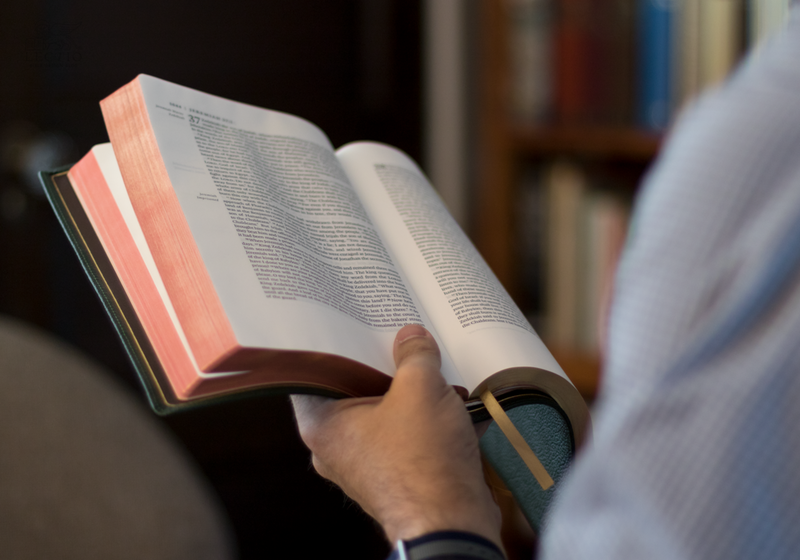 So while the Legacy still seems radical to readers who confine themselves to reference editions, those of us who’ve taken the plunge into reader-optimized Bibles value the Legacy for just the opposite reason: its traditionalism. This beautifully-presented text takes a middle road between the extremes, delivering most of the benefits of readable design while retaining the apparatus essential to the reference paradigm. Not example the best of both worlds, but still a good companion for either of them. 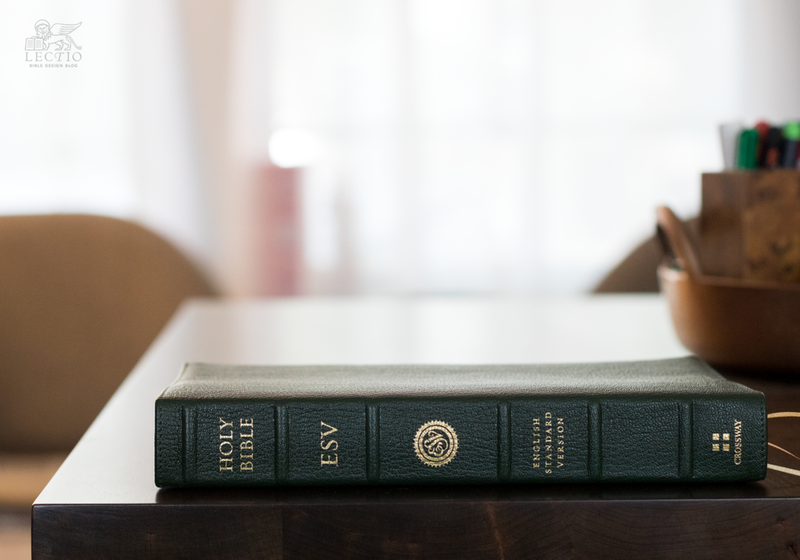 The new Heirloom Single Column Legacy ESV is available from Evangelical Bible bound in green, blue, or purple goatskin. The price as of this date is $169.99. If you are not following Bible Design Blog on Instagram, you can start by clicking here: @bibledesignblog.